I have experienced physio Carly Johnson joining me in clinic over the last few weeks on her MSc placement from La Trobe Uni, Melbourne, Australia. 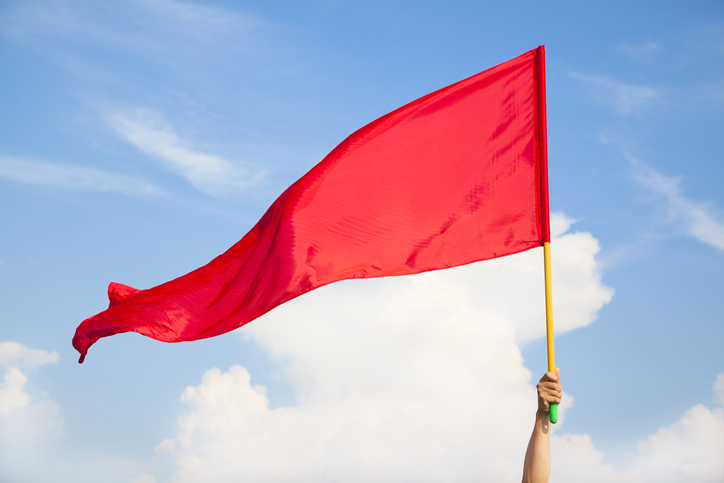 This has made me realise how many interesting/atypical tendons I see, so we decided to blog about some of the interesting Achilles. I see about 5-10 new Achilles per week, >300 per year. 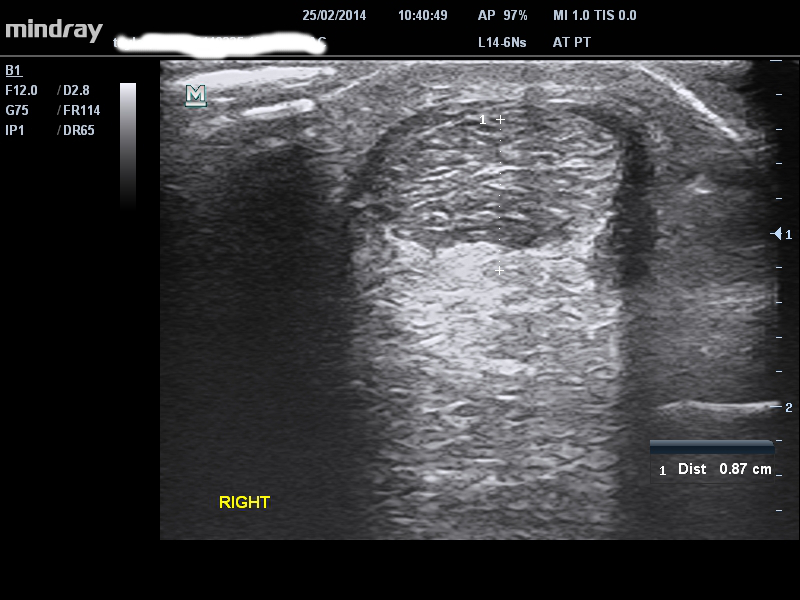 I estimate 60% to be ‘boring old’ midportion or insertional tendon issues, but some are more interesting. 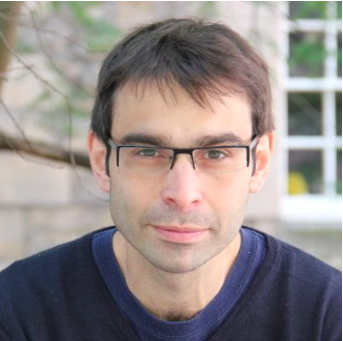 If you would like to know more about diagnosis, assessment management for all lower limb tendons, check out upcoming tendinopathy courses in Sydney, Canberra and Perth. 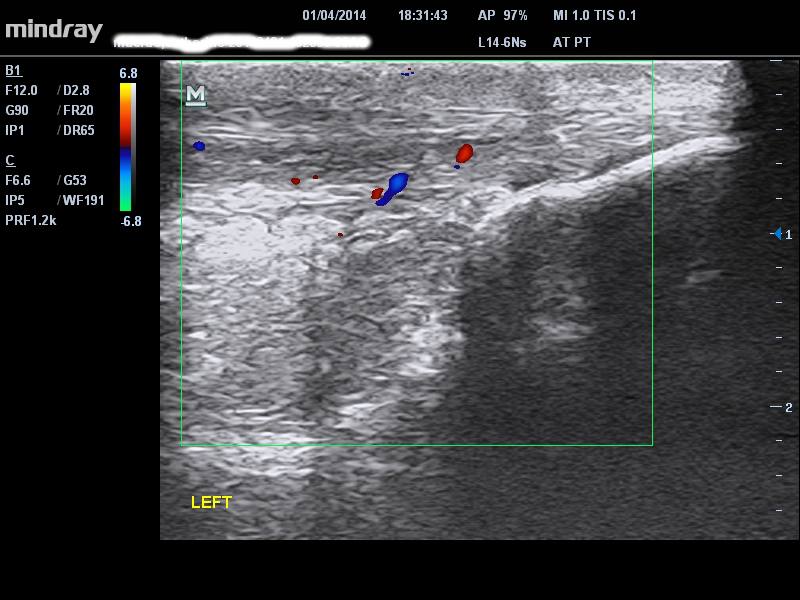 3 – low insertion tendon pathology with Doppler signal, and traction spur. These symptoms may also occur in insertional tendinopathy, if it is reactive or irritable this is where ultrasound is very helpful. Differential palpation of the two tissues can also be very helpful. If there is a lot of fluid or thickening of the bursa on imaging it is very likely to be a pain generator and should be treated. Conversely, a little fluid on imaging is normal in active populations. Our patient in the image below had insertional Achilles and bursa pathology and typical bursa symptoms including pain with low load activities and stretching. So treating the bursa is a priority over and above the tendon. 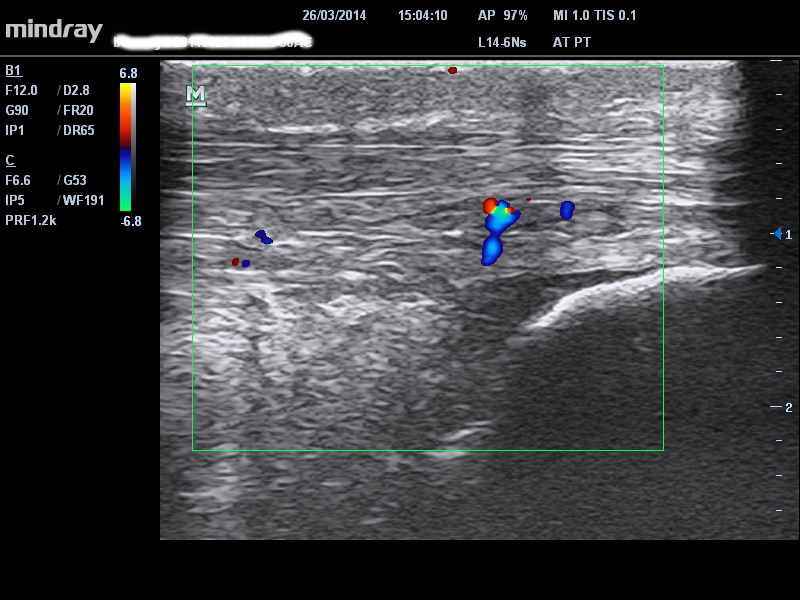 This lady had been misdiagnosed and treated as a tendon injury and the bursa was the limiting factor. 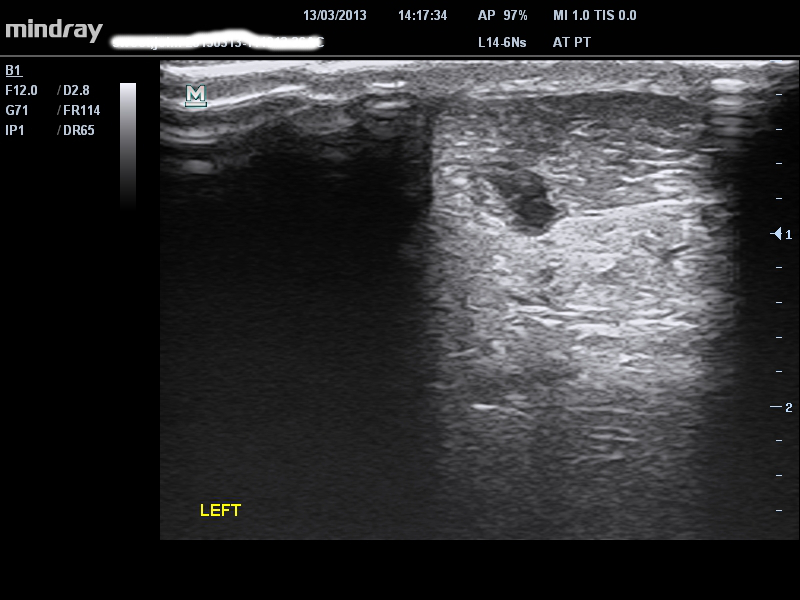 4 – high insertion tendon pathology with retrocalcaneal bursa fluid. 5 – huge fluid collection around lateral paratenon. 7 – Very localised hypo/anechoic region in a patient presenting with signs/symptoms of a tear. Accessory soleus is very rare. I have seen 4-5 in ten years. It usually presents with pain around the Achilles but on closer inspection it is deep to the Achilles tendon. There is an obvious muscle bulk very low deep to the Achilles on both the medial and lateral sides and is often tender on palpation. 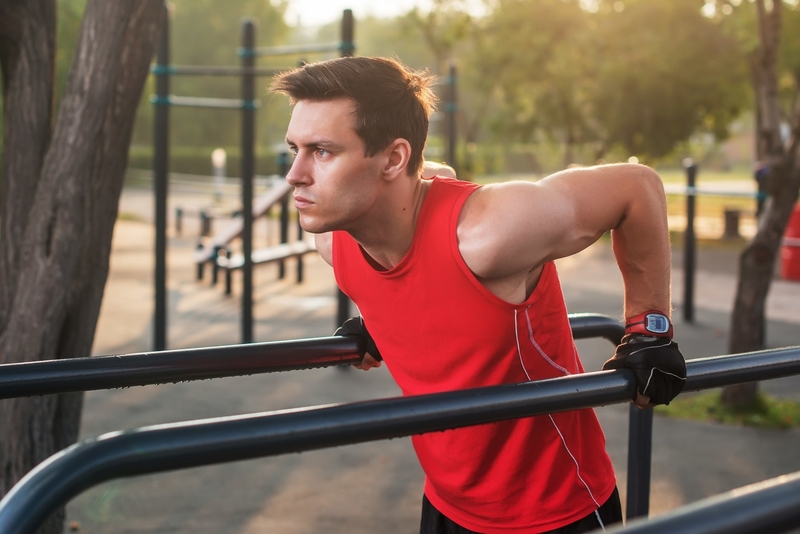 The main differential diagnostic sign is that pain gets worse with activity and does not warm up with activity, similar to compartment syndrome. 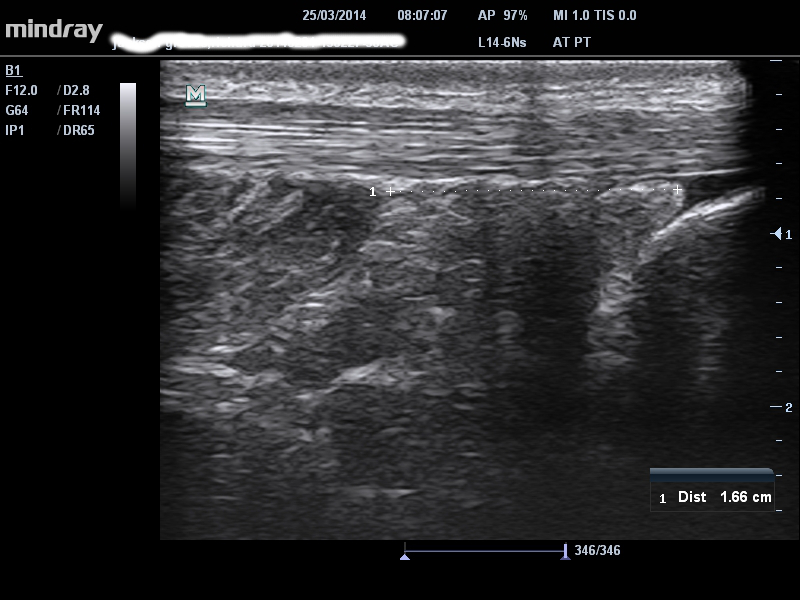 Ultrasound is very useful in confirming that there is a low lying soleus (or accessory) soleus. Our patient in the image below had a distal soleus to superior calcaneum length of 1.6cm whereas most people have at least 3-4cm. 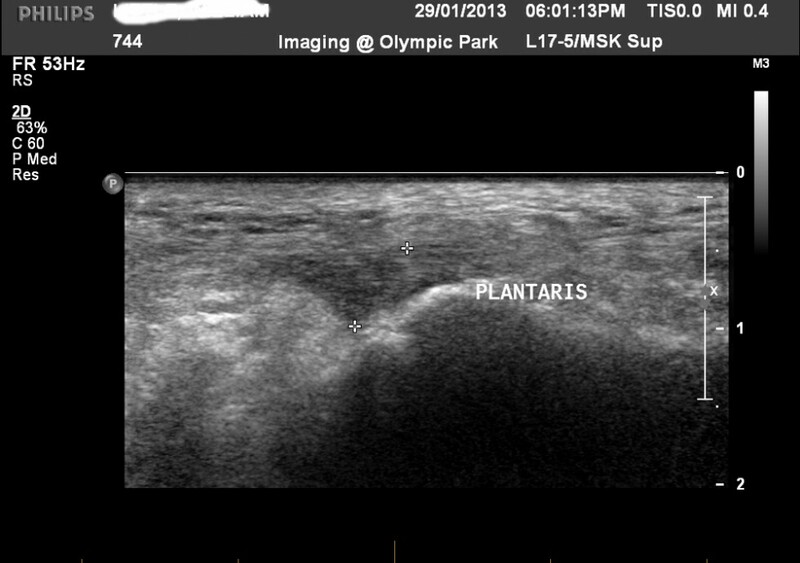 This guy had been misdiagnosed and given 2 PRP injections into a normal tendon !! 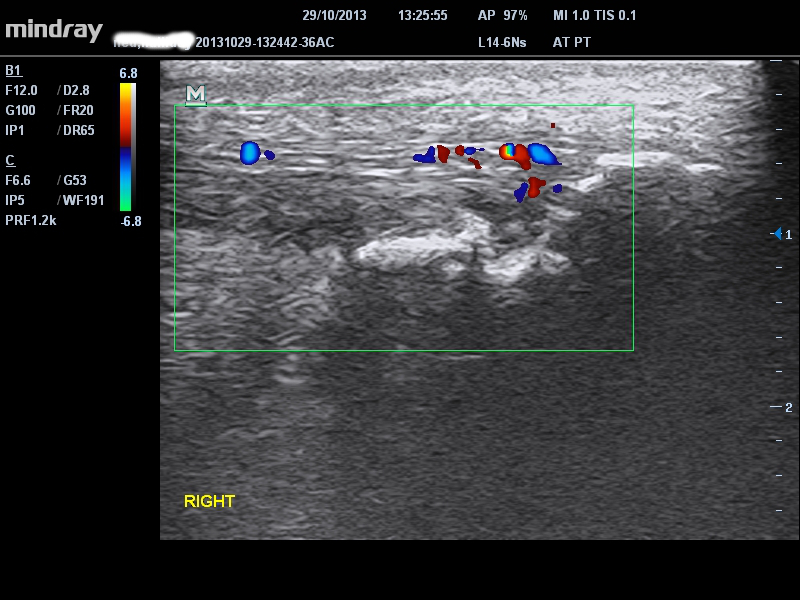 A true accessory soleus reportedly inserts into the calcaneum – I have never seen this. So maybe the more common variant that I have described here should be called a ‘low soleus’. The fat pad can give symptoms in isolation, commonly from compression in dorsiflexion, often when there is an associated but asymptomatic thickened tendon, accessory/low soleus or abnormal plantaris tendon. 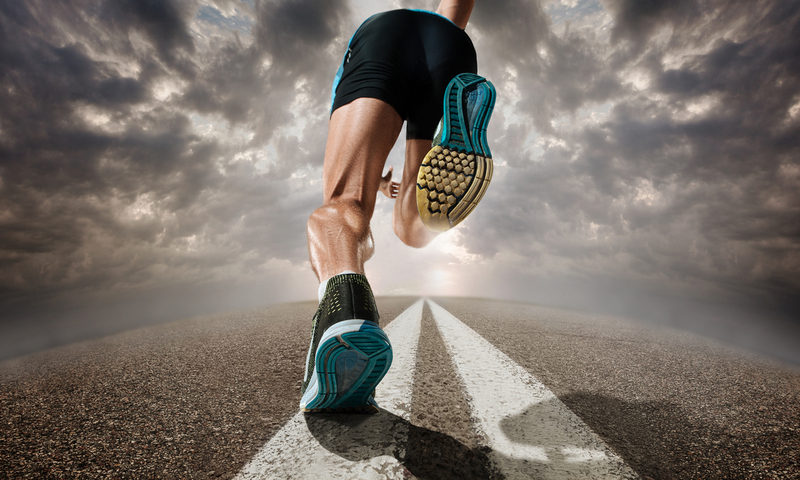 It is usually the fat pad around the proximal/midportion of the Achilles that is affected, rather than more distally. Pain can be diffuse, medial and lateral or medial only. 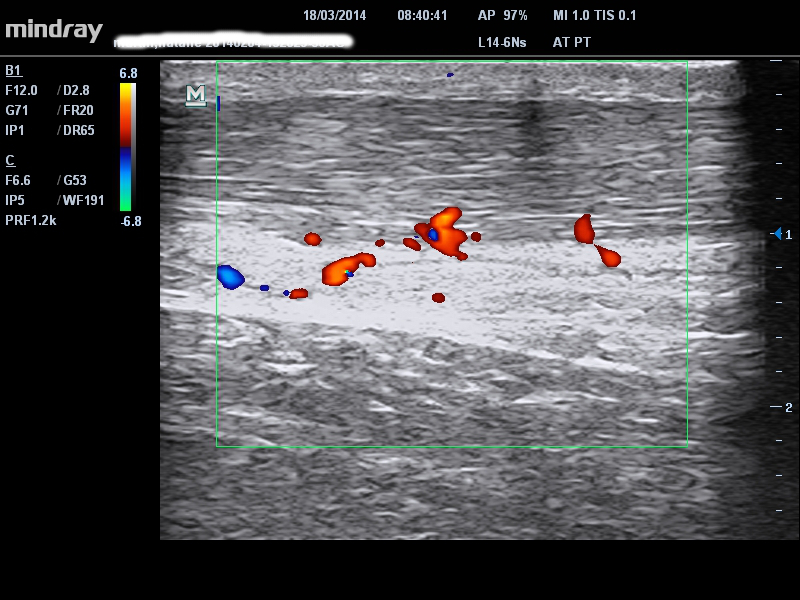 The diagnosis is always clinical and based on differential palpation of the fat pad and tendon – simple but often missed! Also, the fat pad may warm up less well and be more irritable. 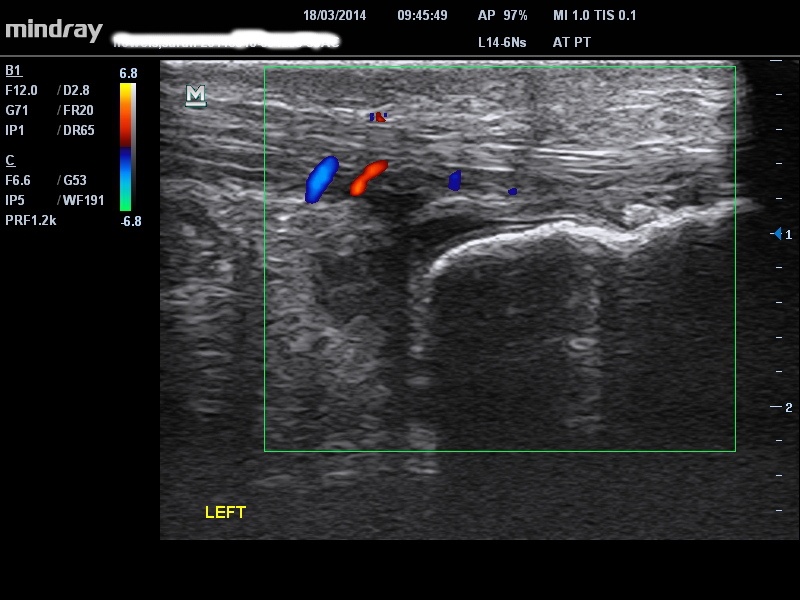 Ultrasound sometimes gives Doppler signal in the fat pad mainly, as seen below, but this is not consistent.